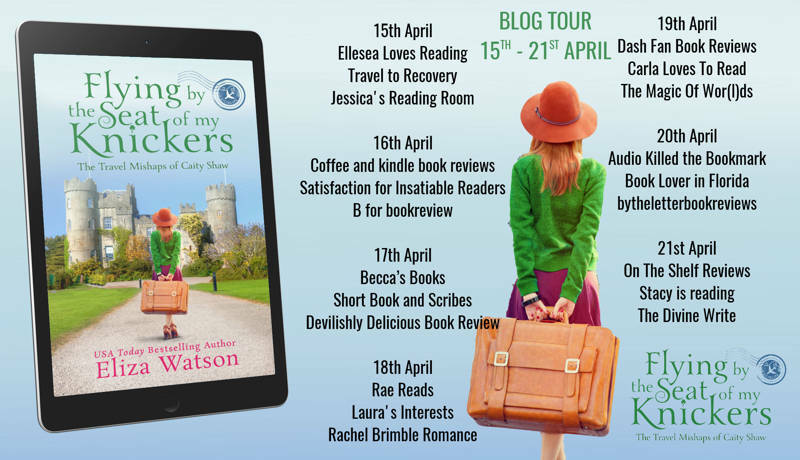 Welcome to my stop on the blog tour for Flying by the Seat of My Knickers by Eliza Watson. If that title doesn’t grab your attention then I don’t know what will! Eliza has kindly written a guest post about her cameo appearances in The Travel Mishaps of Caity Shaw books, of which this book is the first in the series. 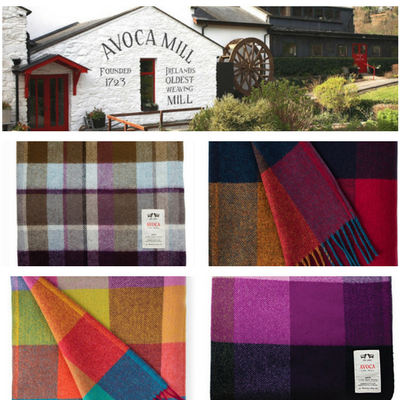 There’s also a chance to win a lovely Irish wool blanket. My thanks to Rachel Gilbey from Rachel’s Random Resources for the place on the tour. My personality, interests, and quirks often sneak into a book without me realizing it, but sometimes it’s intentional. The following are several appearances I make in my series The Travel Mishaps of Caity Shaw. Caity’s Irish grandmother, Bridget Coffey, is named after my ancestor. 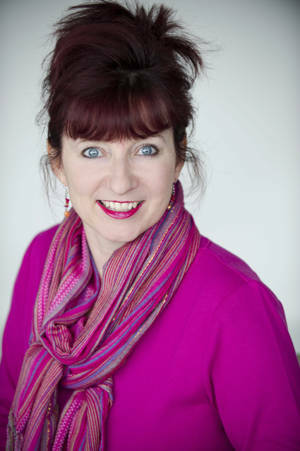 Every Irish surname in the book has a special connection to my family. Even Daly’s pub and Flanagan’s beer are named after ancestors. My mom is Irish and my dad is Irish and Scottish. I’ve been researching my family’s roots since visiting Ireland in 2007 with my parents and cousin. The only thing we knew about my mom’s ancestry was the town where her great-grandfather was raised. We visited it and located his brother’s grave. I said, “Hey, wouldn’t it be nice to come back here and visit some living relatives?” So I went home, subscribed to Ancestry.com, and the journey began. I’m an event planner, like Caity. I’m all too familiar with the type of challenges she faces and it was easy to make her suffer, which of course makes her stronger in the end. However, I am more like her sister, Rachel, who is an experienced planner and proactive, unlike Caity, who is very reactive because she doesn’t have the background to foresee potential problems. I remember being in Caity’s shoes, clueless about my job but excited to travel. Caity is a total klutz. I have numerous scars and I always have a bruise. The scene where Caity trips in front of a VIP was inspired by a real life incident, one of my most mortifying work experiences ever. And believe me, I’ve had plenty of them. Caity has a growing teacup collection, which started with one from her Irish grandmother. She acquires cups which have a personal meaning to her throughout her travels in the series. Several years ago, my grandma passed away and I received part of her teacup collection. My latest addition to the collection is a cup and saucer from a trip to England to research book five in the series. My favorite time to visit Ireland is in the spring when all the lambs are born. I love sheep. I have sheep décor all over my house, including salt and pepper shakers, a knitted teapot cozy, and wall décor. Sheep make appearances throughout the series and play a significant role in book five. I have explored dozens of old graveyards in Ireland. Some of them have been located in the middle of sheep fields, at monastic ruins, or abandoned churches. I’ve traversed some rough terrain and even had my foot once slip into a sunken grave. Caity visits a cemetery at a medieval church based on the one where my Coffey ancestors are buried. The story mentions my ancestor, who played a role in the Irish Rebellion of 1798. Declan sanitizes his hotel room. Before I even unpack, I disinfect my guestroom’s telephone, TV remote, bathroom, drinking glasses, etcetera. I sometimes stick the TV remote in a plastic baggie—a trick I learned from the Travel Channel. This might sound a bit obsessive but I’ve never missed a day of work while on site despite spending a hundred days a year in hotel rooms. Audrey Hepburn makes cameo appearances in several of my books. She is briefly mentioned in Flying by the Seat of My Knickers and plays a bigger role in book two. Audrey is the epitome of style and grace and my all-time favorite actress. Caity has longed to visit Paris since she was a young girl. While growing up, Paris was at the top of my bucket list. I took French in high school and college and studied for a semester at the Sorbonne in Paris. Caity finally has the opportunity to visit the City of Love in Up the Seine Without a Paddle. Things don’t go as she expected but Caity manages to maintain a positive outlook. Vive Caity! Thank you, Eliza. They do say to write what you know! This giveaway is being run by the author and as such I will not be collecting any data relating to it, nor am I responsible for the dispatch of the prize. Thanks so much for having me here today Nicola! It’s been a pleasure, Eliza. Thank you for your fabulous post.